Tried and tested over the generations, Yang Family XinYi has developed into a very clear, powerful, effective system of martial arts with a very powerful health/qigong system. by Yang Hai Ming, 3rd Generation Yang Family. What identifies a fighting style as being an internal or external fist? I believe that it isn't based on attacking or deffensive skills, strong or pliable skills, but on it's intention and aim. Internal fist aims at developing secret aims. External fists aims many times at beautifying the limbs. A person's basic substances are jing (basics of all organic life), qi(breath), and shen (spirit). A persons skills are muscles, tendons, bones, and skin. So internal fists focus on hidden jing, storage of qi, practicing dantien, developing jing, qi, and shen(spirit) as it's aims. External fists focus on stretching, building muscles, strengthening bones, and pliable skin. XinYi is an internal fist! Before starting to practice XinYi fist, you should have a general understanding of it's principles, otherwise it will be very difficult to learn. XinYi Fist is very fast. Most actions are straight, bending, and stretching. No showing off, clear and simple, with tough, pliable power, with natural grace. It doesn't matter how skillful you are, you must keep it clear, simple, and fast. You cannot add extra, pretty looking actions, otherwise you will lose XinYi fist's original style and intent. It's attacking features are: 1) Brave 2) Strong 3) Rapid 4) Fast. It doesn't matter how many changes it could have, it must keep it's principles. XinYi fist emphasizes, brave, violent, short, sinister, rapid, cruel, fast, and sharp. Attacking first, once attacking you must show no mercy. If you want to show mercy, do not attack. Starting like the wind and finishing like an arrow. Chase the wind, pursue the moon, never give up. XinYi fist focuses on straight and fast. So when practicing the 6 Skills, Chicken Step(Legs), Dragon Body(Waist), Bear Shoulders, Eagle Siezing(Claws), Tiger Holds the Head, and Sound of Thunder. Practitioners must reach the 6 Skills combined into one. This involves long term hard work. In XinYi attacking should be rapid like a swallow scooping water and having the power of a bear breaking branches. XinYi fist requires both elbows never leaving the ribs, and both hands never far away from the cheeks. When the hands are attacking put the mind into the chest, just like a tiger pouncing on a sheep. When stretching fully with strength, both elbows hide under the ribs. While stretching out and drawing back, keep the hands close to the body like twisting a rope as one unit. Eyes are viscious, hands are cunning, step into the center and get into the opponents dang. You must fold the kua, and close the dang. Bend the knees, keep the toes in, feet grasp the ground, hollow the chest, stretch the back, these show the key point of XinYi fist. 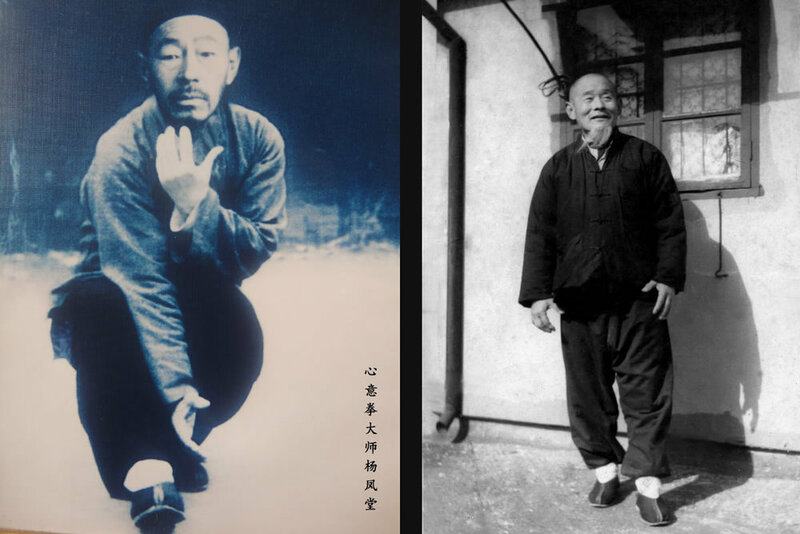 XinYi fist requires walking like plowing a field, standing like roots in the earth. Whether starting, rotating, fallimg, drilling, or stepping, you must stand firmly. Hollow the chest and pull up the back, this allows the heart, liver, and spleen, lung, and kidneys to flow as one unit of Qi. The Qi sinks to the dantien, strength and qi come together. When practicing XinYi fist it requires the upper body to stretch naturally and the lower body to remain solid and firm. While starting, finishing, rising, falling, forward, and backward, the body must keep the above rules. Starting means horizontal(opening), finishing means vertical (closing), forward should be low, withdrawing should be high, turing should be like a hawk flying through the forest, finish like a crouching cat, attacking like a charging tiger. The actions should not look showy or stiff. Feeling graceful on the outside and firm on the inside, the three points go through. Xinyi fist requires head, shoulders, elbows, hands, kua, knees, and feet to cooperate together properly. In attacking the body goes first, hands and feet go together. If the hands go without the feet, the attack will fail. Only when the hands and feet go together meeting the person is like pulling a blade of grass. The heart combines with the mind, the mind combines with the qi, the qi combines with the strength. The three points support each other. The tip of the nose, the tips of the shoulders, and the tips of the feet. The three hearts are full, the back heart, hand hearts, and feet hearts. The three hearts are round, back heart, arms, and the tiger's mouth. The three steps link, meaning the actions go continuously. The three points follow, the four ends are great, internals lift, externals follow. Qi pushes, postures are firm. One limb moves, one hundred follow. The mind leads the qi, the qi pushes the strength. Internals and externals combine together, the whole body combines as one complete unit, forming the Six Harmonies. Yang Family XinYi Yang Sheng / Qigong Methods are very powerful, I believe, " it is a stand alone Health/Qigong System." It has a very effective, systematic method of learning and progression. Focusing on awakening and developing the dantien and refining the "three treasures, th affect on the practitioner is amazing. Simple and effective for practice by all fitness and health levels. Practicing Yang Family XinYi Qigong will take your health and fitness to a whole new level. Incorporating Yang Sheng principles and methods into one's daily life will change your life. XinYiLiuHe Quan (Heart Mind Six Harmonies Boxing) is a very powerful ancient Chinese Internel Martial Art, appearing in written records in the late 1600's. Ji Ji Ke (alias Ji Long Fong), "The Father of XinYi". Ji Long Fong was a very skilled spear master who combined his spear skills with the ten animal shapes (bear, eagle, dragon, monkey, snake, hawk, horse, swallow, tiger, chicken), creating a very powerful internal martial art with amazing health benefits. Yuan Feng Yi (1840 - unknown), Yuan had three students, they were called "The Three Knights/Heroes of Zhoukou". They were Shang Xue Li, Yang Dian Qing( (Yang Family 1st Generation), and Lu Song Gao(?- 1962). All three trained very hard and diligently, and by working together they all got the skills of XinYi. Yang Dain Qing (unknown - 1942) Our lineage starts with Master Yang Dian Qing, learning from Yuan Feng Yi, from an early age, Yang Dain Qing worked very hard to get all the skills of XinYi and pioneered Yang Family XinYi into the future. Yang's skills were very high level, he was known for being very powerful and extremely kind. Yang Family XinYi was only passed within family, no outsiders. So very few people know Yang Family XinYi. Yang Dian Qing passed to his sons Yang Xiang Lin, and Yang Feng Tang (2nd Generation Yang Family). Yang Feng Tang (1896 - 1984) was very skilled in Yang Family XinYi. He was known to be very hard working and very strict when it came to teaching his familie's art. He achieved great skill during his lifetime. He was known for his head attacks, (a specialty in XinYi). He spent his lifetime developing Yang Family Xinyi. He did not teach many people, only passing to his son Yang Hai Ming. Master Yang Hai Ming (1945-present) 3rd Generation Yang Family, is the current standard bearer for Yang Family XinYi. At age 73, the health benefits of Yang Family XinYi become very apparent. Master Yang trained from the age of 7 under the strict tuttelage of his father, XinYi is in his essence. Through hard work and perseverance, Yang was able to achieve high level XinYi skill, and is constantly improving and developing his Yang Family XinYi. Ryan Bloomfield (1976 - present) 4th Generation Yang Family, is Master Yang Hai Ming's international representative, the only student teaching Yang Family XinYi. To organize a workshop in your area, get in touch here.